The Mane Objective: Brands That Love Black Money... Where You At?! 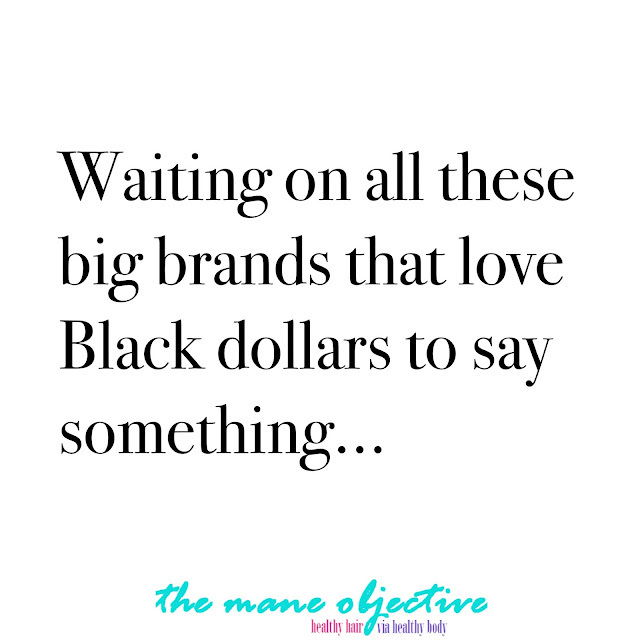 Brands That Love Black Money... Where You At?! I don't have a lot of words right now, so I'm gonna keep this brief and to the point. In fact, I don't have the desire to do much of anything right now. In the wake of the Black body count that keeps rising at the hands of the overseer "law enforcement", I'm finding it increasingly difficult to have energy. To function. To string together a coherent thought that doesn't bring me to tears. Last night I prayed. Hard. I prayed for my fiance. My dad. My brother. My brother-in-law. My three little nephews. My uncles. Cousins. Friends. I prayed for God's protection over their lives. I prayed for their safety. I normally pray that prayer, because we live in a world rife with violence, theft, assault, robbery, kidnapping, car accidents, etc. But last night, I prayed that prayer fervently because Black men are literally being executed by police officers for simply existing. Black people all across the country are living in a state of panic induced fear. We're afraid that our significant other, our brother, our father - will be next. Murdered in cold blood without provocation. We're in pain. We're angry. We feel helpless. There's anguish. Hurt. And the most bitter pill we're swallowing is injustice. Because we've seen this play out exactly 136 times since 2016 started. There will be no justice. There will be no conviction. Because ultimately, Black lives don't matter...but Black dollars do. This morning, as I did my #MorningMillennial social media scroll, I noticed something on Instagram. Brands like Carol's Daughter, Devacurl, Cantu, Dark & Lovely, and hell, even Shea Moisture carried on as if two Black men hadn't been murdered in cold blood by police officers in 24 hours. They posted about products, makeup, Essence Fest recaps, and more. Y'all were gung-ho to post about the 4th of July...but now it's July 7th and you're silent. I don't know about you, but today, more than any day - I need love. I need encouragement. I need support. To have my humanity reaffirmed. To know that people are at least awake (if not woke), and are allies. I need to know that if I spend my money with you, that you value me beyond your bottom line. I don't know about you, but I'll be going through my social media with a fine tooth comb. Paying closer attention to who I give my visual currency to. Loving a little harder on Black-owned brands that stand with me. I'm just one person though. If you need some help getting started, or are wondering how the natural hair community can make an impact, click here to read 3 ways to do it. This just reaffirms that I need to support those who support me! I saw, but for me and a few others that tagged me, it was disheartening because they took all day. But a few weeks ago when it was Orlando, the prayers and sympathy were immediate. All tragedies should garner the same reaction, and not take until the end of the day to say something. If you read the comments, people were literally waiting and hoping they'd speak out. I'm still disappointed. I expected more from a Black "owned" family company. Thank you for dropping that in! This is so true sis! We have to do this and stick to it. Not just agree to do it and then next week after everything dies down we are back to what we have always done. Oh absolutely. The lines have already been drawn. I think we've reached that point where (hopefully) the majority of folks are fed up and ready to actively make change. Okay, so I'm not trippin'. I noticed multiple brands still carrying on with business as usual and I was bothered. I wondered if they had heard the news or were blatantly avoiding. It was a little disheartening. Thank you!!!!! I'm just glad more than just me recognized it. I'm tired of brands picking and choosing what they support. I am so glad you said something. Another lady & I commented on Shea Moisture's page because the day of the Dallas shooting, they posted an ambiguous MLK picture that had a written quote. Many people posted they are so.glad SM cared enough to post. By the time I posted my disgust, they had already started with responses to comments that were praising the . They simply ignored the posts that mentioned Akron & Philando. I was already on the fence about being over Shea Moisture, but had been questioning myself. I decided then & there I was done. Shea Moisture posted tributes to Philando & Akron on the day of their funerals. Someone who I met in the comments tagged me in the posts. I refused to respond on Shea Moisture's page. I had made a decision & decided to stick to it. I made the same decisions about vloggers I had been following. If they weren't going to be conscientious, that was a conflict of interest for me. I'm a recent sub & was so glad you were one of the first to acknowledge it publicly. That takes a lot of courage! I also posted on Motor's IG page, they posted the day after Dallas. I commented & told them to peace out, I couldn't support a brand that didn't represent my values for human life. They responded saying they are based out of Dallas which is why they posted. Too little too late. I'm replacing the SM & Mop Top products. If I knew if a shelter, I would get rid of those and all th other brands I'm not continuing doing business with.